Save big on the ultimate The Talos Principle Gold Edition featuring base game content as well as all of the post-release content, and more. Let’s be honest here. We’ve spent all our virtual ammo in the recently released Serious Sam VR: The Second Encounter, and while completely ignoring reality we got stuck in an existential crisis. The positive kind. Then we thought – why not share this mood with others. And ta-da! Here comes something really exciting! 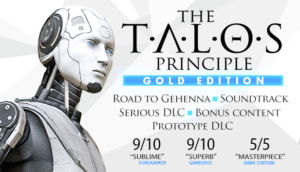 Make this week as philosophical as it gets and grab the freshly released The Talos Principle Gold Edition, featuring all DLC and bonus content published post-release. All this at a huge 81% discount on Steam! Challenge yourself with the Road to Gehenna expansion and Follow Uriel, Elohim’s messenger, through four episodes as he explores a hidden part of the simulation in an attempt to free the souls of the damned at all cost. Jump in the game in a different role with the Serious DLC and enjoy the completely new and humorous Serious Sam script. Finally, explore new levels and solve over 100 puzzles from the early development stage in the Prototype DLC. But you know how this goes, things don’t stop here. Also included in The Talos Principle Gold Edition is the Bonus Content featuring a making-of documentary and a digital terminal booklet with over 100 pages of text from the in-game terminals. Of course, The Gold Edition includes the official soundtrack featuring 27 amazing original tracks from the game. For more information and future updates on The Talos principle follow Croteam on Twitter and Facebook.